Modern technology uses a lot of electrical and field energies. Mobile phones, phone masts, power lines, wireless networks are all human technologies that involve field-effects. All these technologies use the electromagnetic spectrum. All energy, in fact, exists somewhere on that spectrum, including visible light, micro waves, and dangerous high-energy gamma radiation. Some people fear the effects of electromagnetic radiation on the human body (I assume they are not afraid of light, though), and this text is about that fear. Fear about radiation from mobile phones and masts, power cables, and communications equipment in general is generally misguided, but, is perpetuated by sensationalist newspapers, and occasionally by mass hysteria1. Partially as a result of these fears, scientists have investigated the effects of electromagnetic radiation in great depth. EMF radiation connects all forms of radiation - X-Rays, ultraviolet rays, gamma radiation, radio waves, microwaves: these all have different frequency ranges, and scientists have studied the effects of all of them on living things. Over 25,000 articles have been published in the last 30 years and no risks have been found to result from exposure to fields associated with everyday human technology. For example, a Danish study of 420,000 mobile phone users avoided relying on user's memories by analyzing usage statistics from telecoms records and "found neither long nor short-term mobile phone use associated with an increased risk of cancer"2. The USA's National Research Council studied 500 scientific studies, finding "no conclusive and consistent evidence that electromagnetic fields harm humans" in any way at all (not just cancer)3, and another 8-year investigation found no harm to children from EMF from power lines1. Major scientific bodies including the World Health Organisation, the EU, and the American FDA and CDC have all come to similar conclusions. A continuous fear of something, or expectation that it is bad, can cause symptoms that are called 'psychosomatic' because they are caused by the mind. Such symptoms most prominently include headaches, nausea and rashes. These are also the most common symptoms suffered by those who believe that radio masts, mobile phones, etc, are causing them harm5. Neophobia is an additional psychological factor that comes into play, where people fear new technology. Evidence for neophobia is that people protest against putting mobile phone masts near schools (which is safe) but happily take their children to a beach under the sun (where ultraviolet rays cause skin cancers). Yale physicist Dr. Robert Adair calls the reaction electrophobia1. Scientific reassurances don't tend to work with some people, because they lack understanding of the underlying physics. The best cure for psychosomatic illnesses and neophobia is education and understanding, a process that is unfortunately hindered by sensationalist papers and general scientific ignorance. A whole host of weird and wonderful products always manifests itself around irrationality, and mobile-phone-radiation fear is no exception. Because the symptoms are caused by the mind rather than by reality, 'cures' that work simply by reassuring the user that they are protected tend to work to reduce and remove those symptoms. Tricks of the mind can cure tricks of the mind, but the result is that quack remedies often have followers who go around telling everyone else that some ridiculous product actually works. The industry is fuelled by confusion and irrational fear, but, the existence of these gadgets furthers public concern. Some of the producers might also think their own gadgets work, but it would be better for all if industries such as these shut-up shop. The surest way to achieve this aim is to educate people about the futility of their products, and educate people more on the physics of electromagnetic radiation, and of course, improve sceptical thinking in general. There are three ways that electromagnetic radiation can cause harm within to living bodies. Each effect is particular to a certain range of frequencies5. Our main exposure to dangerous electromagnetic radiation is from direct sunlight. electric currents Low frequencies (0-3 KHz) Magnetic fields might do weird things to our bodies. Normal human technologies do not produce frequencies in this range, and, the Earth itself has a magnetic field. Microwaves Absorption of energy causes heating, which if enough happens at once, can damage tissue. Energy has to specifically and intentionally focused to have an effect. Molecules are damaged Ultraviolet light, X-rays, gamma rays Carcinogenic due to occasional DNA damage. We are exposed to these from space and from the sun, but not from human technology. “All electromagnetic radiation consists of small particles called photons. The energy of a photon is determined by a formula called Planck's law: the energy of the photon increases as the frequency increases. Now consider a photon of yellow light. This has a frequency of some 5x1014 Hz. The energy of such a photon is approximately 2 electron volts [...]. If there is an increase in the power, only the number of photos increase, not its energy. Thus, a standard yellow sodium lamp with higher power rating provides more light with more photons, but each photon still has exactly the same amount of energy. These photons, which en masse make up electromagnetic radiation, are absorbed by the atoms that make up all biological matter. The frequency of the radiation determines what method of interaction is important. If the frequency of electromagnetic radiation is high enough, photons will have enough energy to ionize atoms, i.e., to interact with electrons or protons and therefore interfere with molecular structure. This becomes possible at a frequency just above that of visible light - ultraviolet light, and includes gamma radiation and x-rays. None of them are produced routinely by human technological gadgets. Gamma rays are found in space, and as the result of radioactive decay and nuclear reactors and atom bombs. X-rays, like radio waves, pass through most material without any interaction at all, and are unlikely to cause any cellular damage. This is why they are safe to use on patients in hospitals. There is the chance, however, that rare interactions could damage cells or DNA (something that radio waves cannot do), which is why medics (and dentists) who use X-ray equipment frequently have a screen they stand behind to reduce constant exposure. What we are exposed to all the time is ultraviolet light. The sun produces this and the Earth's surface is bathed in it. It has a slightly higher frequency (and therefore higher energy per photon) than light, and is absorbed by most substances, including skin. It is one of the most common causes of cancer and skin problems. The way that ionizing photons cause cancer is as follows. DNA is the famous double-helix chemical strand that controls how our cells manufacture proteins. It is a delicate process. DNA is held together by chemical bonds, the same as all other molecules are. High energy photons can knock electrons out of their orbits, or sometimes interact with the nucleus of an atom. To do this, the frequency of the radiation has to be high enough. It can then damage the DNA. If the frequency isn't high enough (mobile phones and radio waves are not), then, the radiation cannot cause ionization no matter how much of the radiation there is. Even when it is absorbed it is rarely cancerous. Most the time, because of the double-helix structure and various cellular mechanisms of DNA monitoring, the damage is repaired. It is very unlikely that photons happen to hit DNA in a cell (a cell is very large compared to the size of the DNA in the nucleus). It is also rare that when a photon hits DNA that it causes any lasting damage. And if a cell goes wrong, it is also rare that this causes the cell to turn into a cancer as most genetically damaged cells are either destroyed or self-destruct (apoptosis). Because of the negating factors, it requires continued exposure to high doses of appropriate radiation in order for cancers to be caused. The sun, being a massive nuclear reactor (333 thousand times more massive than the Earth), is one such source. Compared to everyday exposure to ultraviolet light from the sun, no everyday human technology poses a comparable risk, and in addition, the frequencies used by telecommunications equipment is simply not high enough to be ionizing, no matter what strength of signal you are exposed to. Ionizing radiation can be dangerous due to the occasional chance of molecular damage to cells. Some other (lower) frequencies of the electromagnetic spectrum are dangerous not because they knock electrons out of orbit, but, because they are absorbed by liquids and cause heating. In a microwave oven, it is generally water that absorbs the emitted photons. The temperature required to do damage to us is generally rather high because in our bodies, liquids are generally full of long and heavy biological molecules that raise the heat capacity of the liquids. European worry-worts are often criticized for their hindering of European industry with health and safety red-tape. It sometimes seems that these beaurocrats, and those staffing international bodies, go out of their way to find unlikely dangers in products. Yet despite their best efforts (over 25 000 articles have been published), the scientists have found that this time, there is no threat. Communication masts, mobile phones and power lines do not interfere with human health. The FDA and the CDC in the USA have come to similar conclusions, as have "most of the world's major national public health organizations"5. Articles in an edition of Skeptical Inquirer (2009)5,4,6 have served as my main sources on this page. This magazine excels at finding fault with lines of thought not supported by evidence. Its science investigators have failed to find any failings in the mainstream scientific opinion that communications technologies pose no risk to health. A Danish study of 420,000 mobile phone users avoided relying on user's memories by analyzing usage statistics from the records of telecommunications companies and "found neither long nor short-term mobile phone use associated with an increased risk of cancer"2. The USA's National Research Council studied 500 scientific studies, finding "no conclusive and consistent evidence that electromagnetic fields harm humans" in any way at all (not just cancer)1. An 8-year study found no harm to children from EMF from power lines1. The Bio-Initiative Report was composed by "a minority of scientists [who] have helped fuel the hysteria. Yet the Bio-Initiative Report has been widely criticized in the scientific community for promoting only poorly conducted studies that support its alarmist views while ignoring far more rigorous and comprehensive studies that show no danger"5. In order to have any chance of causing cancer, electromagnetic radiation has to be of a high enough frequency so that it can ionize atoms, as I have explained above. Even if such a photon is absorbed, the chances of it causing cancer are miniscule, but, it still does happen. The frequencies used by human technological gadgets are well below the frequency at which ionization occurs. The frequencies used by mobile phones are one million times too low to have enough energy to cause ionization. If you stood next to the world's most powerful mobile phone or mast, you would merely be exposed to a larger dose of non-ionizing radiation. The risk does not come from the power levels of the signal. To make a mobile phone's radiation ionizing, you need to increase its frequency by a million times, not just boost its power (which leaves the frequency the same). Obviously, no mobile phone is powerful enough to do this (and it would no longer be using radio waves). In fact, no gadgets use frequencies that are ionizing. Is this all really true? We know that we have the physics right, because, in the last century we started pumping out massive signals from broadcast antenna at a strength many times higher than mobile phone masts have ever used. Also, we are all exposed to a constant and dense fog of electromagnetic radiation from telecommunications equipment (some call it 'electrosmog'). And as our use of radio waves has diversified and increased in the modern world, cancer rates have fallen. Modern telecommunications technology does not cause cancer. 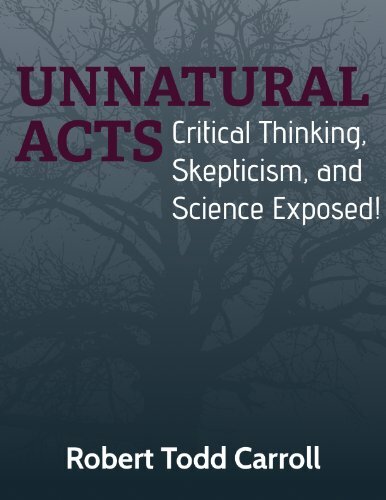 (2011) Unnatural Acts: Critical Thinking, Skepticism, and Science Exposed!. Amazon Kindle digital edition. Published by the James Randi Educational Foundation. An e-book. Of particular note is appendix A: Cell phones, Radiation, and Cancer, p216-230.